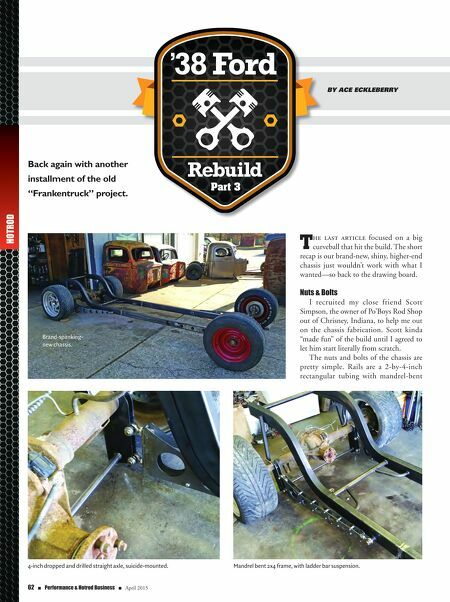 62 n Performance & Hotrod Business n April 2015 HOTROD T he last article focused on a big curveball that hit the build. The short recap is our brand-new, shiny, higher-end chassis just wouldn't work with what I wanted—so back to the drawing board. Nuts & Bolts I recruited my close friend Scott Simpson, the owner of Po'Boys Rod Shop out of Chrisney, Indiana, to help me out on the chassis fabrication. Scott kinda "made fun" of the build until I agreed to let him start literally from scratch. The nuts and bolts of the chassis are pretty simple. Rails are a 2-by-4-inch rectangular tubing with mandrel-bent Back again with another installment of the old "Frankentruck" project. 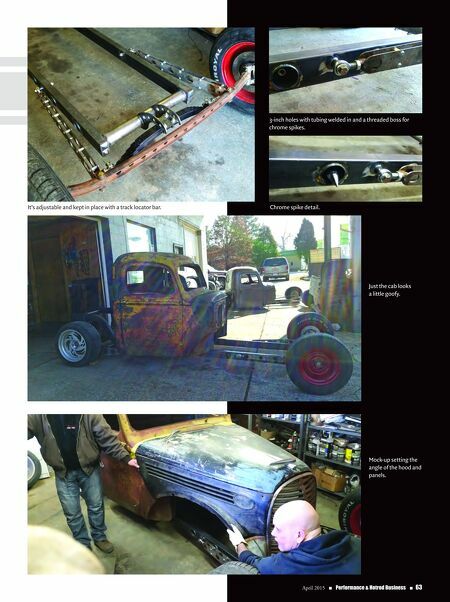 By Ace eckleBerry Part 3 Brand-spanking- new chassis. 4-inch dropped and drilled straight axle, suicide-mounted. Mandrel bent 2x4 frame, with ladder bar suspension.